Oak Square – Saturday, December 1st at 5 p.m.
Brighton Center – Washington @ Market Street - Monday, December 3 at 6 p.m.
Jackson Mann School/Community Center - Thursday, December 6 at 11:30 a..m.
The current issue of Preservation magazine reviews Harvard's campus plans for expansion into Allston in a story you can download here. The quotes say a lot about the concerns and perspective of people interviewed. It sounds like Ray Mellone is suggesting Allston/Brighton residents should be more forgiving to Harvard and he would like Kevin McCluskey and Kathy Spiegelman to have a more sympathetic audience. Kathy Spiegelman tells us that Harvard has no idea what projects it will propose in the next few years. That reinforces a widespread concern that the ad hoc approach Harvard and the BRA have used so far will fail to address major issues like transportation that can't be resolved with a narrow view. "This neighborhood is going to be under construction for the next 20 to 40 years. That's basically the rest of our lives." Asked what elements of the new campus might be in place by 2012, Spiegelman didn't know: "I'd just be making it up." In connection with the Science Complex project, Harvard's commitment to housing will be fulfilled directly by a contribution to the Neighborhood Housing Trust Fund through the City’s linkage requirement, which for the Project is proposed to total $3.8 million based on the current square footage of the Science Complex of approximately 589,000 gross square feet. To learn more about the Neighborhood Housing Trust, this 2004 report by the City of Boston gives a very readable overview of the program and its accomplishments. It tells us that "Since its inception, the Neighborhood Housing Trust has committed $81,458,485 in linkage funds. These funds have helped create or preserve 6,159 affordable housing units in 115 development projects throughout the City of Boston." But Harvard's linkage payments don't have to be spread throughout the City with only a small fraction coming back to the neighborhood most directly impacted by Harvard's expansion. The City's report explains that there are two options for meeting a project's housing-related linkage obligation. The first option is for the developer to make a payment to the City of $7.18 for every square foot of gross floor space in the project. This is the option that Harvard has proposed using. "As an alternative to direct payments, developers may fulfill their linkage obligation by opting to be directly involved in housing creation. This option requires developers to create or assist in the creation of housing units for low- and moderate-income residents of the city. The cost of this housing creation option must be equivalent to the housing payment the developer would have made." So Harvard could spend all of its $3.8 million right here in our neighborhood! What great news! Now the not-so-great news. For some reason, Harvard is not proposing to do this. Apparently, Harvard would rather have this money spent on housing projects elsewhere in the City. Why would that be? Sheila Dillon of the BRA will be at tonight's Harvard Allston Task Force meeting (6:30 at the Honan Library) to tell us more about the housing linkage program, so maybe these questions can be answered there. A nice column in today's Globe about Jim Unis, a coach of the undefeated 10-0 Brighton High football team and history teacher at the Boston Community Leadership Academy. Allston celebrates its 19th annual Open Studios today and tomorrow from Noon - 6pm. Styles range from traditional to avant garde. Three buildings provide easy access to all studios. Boston has 20 public "pilot" schools that are run by independent governing boards and are free from many union and school system restrictions. 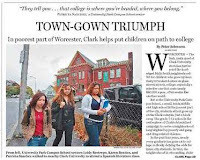 Four of them are in Allston and Brighton - Another Course to College (grades 9-12), Baldwin ELC (K-1), Boston Community Leadership Academy (9-12), and the Thomas Gardner Extended Services School (K-5). A report being released today by The Boston Foundation shows that in many key areas students at pilot high schools are doing better than students at traditional public schools. 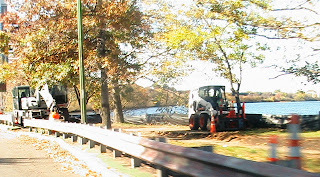 Construction crews have been working for the past few weeks to repave the pathway along the Charles River from Cambridge Street to the BU Bridge. This is a much needed improvement to repair the many unpleasant and unsafe bumps formed over the years by tree roots pushing up the pavement. Thanks to DCR on behalf of the thousands of people who will enjoy this path much more in the years to come. 31 Lothrop St - Create off street parking for three vehicles. 51 Franklin Street - Change the legal occupancy from a two-family dwelling to a three-family dwelling, install second level to existing laundry room, build new stairway, build a new front porch and erect third floor dormers on front and rear. Today's Globe features an Op-Ed written by Richard Dimino, president of A Better City, and Stephanie Pollack, from The Center for Urban and Regional Policy and BlueWave Strategies. Titled "On life sciences, keep moving" it makes a case that for Massachusetts to continue to be a thriving center of life science researcher and businesses it must do more than provide business incentives and workforce development. Their recommendation is that we need to take serious action so "people in this industry can get to work and get around easily." Of course they aren't suggesting a private transportation system only for life science workers and they note that "all communities, workers and employers benefit from better roads and transit." Dimino and Pollack don't specifically mention Harvard and Allston, but really they don't have to. Harvard's plans for massive life science development in Allston is well known. And equally well known is the poor condition of our transportation system. Not only is the public transportation in North Allston slow and inconvenient for getting to common destinations (for example, try to take mass transit from here to the Longwood Medical Area). But cars and bikes on our roads don't do much better as shown by the map with Level of Service grades for major North Allston/North Brighton intersections. A great irony is that Stephanie Pollack is a partner at BlueWave Strategies and BlueWave is one of Harvard's lead consultants. Harvard's plans propose basically nothing tangible to improve public transportation for its new life science campus. "Someday maybe there will be an Urban Ring that might cut through Allston" isn't much of a plan. Is Pollack trying to explain to decision-makers at Harvard what she has explained to everyone else? Why does it seem like they aren't listening or don't agree? Lengthen the term of the councilors to four years, stagger their elections so they are not the same year as the mayor, and possibly limit terms for Council and Mayor to 12 years. Now those could be good things to do, but CPR? Sounds more like cosmetic surgery to me. Sunday at 6:08pm, officers from District D-14 (Allston/Brighton) responded to a radio call for an armed robbery at 57 Franklin Street. The suspect was described as a black male, slim build, approximately 18-20 years old with a slight moustache wearing a blue hooded sweatshirt pulled tightly around his head. The suspect approached the counter holding a shotgun at his side and demanded cash. The suspect fled with an undetermined amount of cash. The Boston Police Department is actively investigating this incident. Anyone with information is urged to contact (617) 343-4566. A victim reported being robbed at 57 Franklin St. shortly before noon on Oct. 19. The victim told police a man pointed a long, black gun at her and demanded the money from the cash register. The suspect escaped with about $500. If we have weather like that on November 25 do you think 86% of the seats at Gillette Stadium will be empty? Of course not! And one reason is that people spend a lot of money to buy tickets to see the Patriots. Many people have already thought about how this reasoning could be applied to voting. Read about some of them at http://www.whynot.net/ideas/1352. "It's very, very sad," said Boston Election Commissioner Geraldine Cuddyer. Maybe the Secretary of State and Boston Election Commissioner are only supposed to run the elections, not promote the elections. Maybe the Globe and Herald aren't trying to lead the discussion and establish public discourse about important civic issues. If that is the case, then why are these people wringing their hands in despair when they seem to have the power, but have done so little, to do something about this low voter turnout that has them so depressed? Bloggers (Mike Pahre, myself, and others) and non-profits (MassVote) with our relatively modest reach are doing what we can, but how about some can-do spirit from the people who could really move the ball? Unofficial results show Mark defeating Greg Glennon in today's election by 900 votes. Great start for the ABNNF - We need you at our next meeting on Nov. 20! We had a great meeting last night with 70 people from across the neighborhood attending the kick-off meeting of the Allston/Brighton North Neighbors Forum (ABNNF) at the Thomas Gardner School. It was a diverse and energetic group and we discussed how to work more effectively with our elected officials and how to develop a neighborhood-wide plan. The topic with the most urgency is the need to propose a meaningful and specific set of community benefits to the City and Harvard to accompany the Harvard Science Complex that was approved recently by the BRA. We have less than two months to put forward our proposal and our members encouraged us to meet again in November to continue work on this. There is no question that the City will agree to some set of benefits with Harvard. But what is not clear is how much our community - which bears the brunt of impact from Harvard's construction, property mothballing, and general expansion - will be the recipient of these benefits. The Harvard Allston Task Force does not seem to be converging on a broad-based, consensus recommendation for these benefits and the ABNNF hopes that with wide outreach and open dialogue we can reach this much-needed clarity. The phrase that I heard most throughout the night was about the community's need to speak with "one voice". There was also an appropriate dose of skepticism voiced last night, but I take that as a positive reflection of our collective openness and honesty. But we also had a great turnout for the meeting and there was a palpable sense of people wanting to unite and get something done. I felt that and I think other neighbors and our elected officials and their representatives who were there felt it too. Most importantly, we need to build on our momentum that we have established. 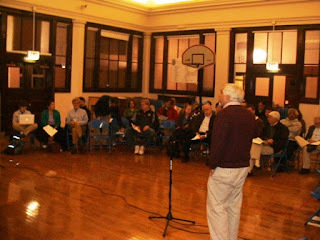 Having many neighbors join us at our next meetings is crucial to establishing our legitimacy. So if you were at the meeting last night I hope you found it worthwhile and you will come back and spread the word to your friends and neighbors. If you weren't able to make it, please consider attending our next meetings. Our email group (http://groups.google.com/group/ABNNF) is already up to 99 members, please visit and join the group today! The next meeting will be Tuesday, November 20 and we will also meet on Tuesday, December 4. Both meetings will be at the Gardner School (30 Athol St) from 6-8 p.m. Cheers to Brighton-based New Balance for their generosity to "help build the New Balance Foundation Marine Mammal Center and to develop programs that use seals and sea lions to promote childhood fitness"
Who will decide the future of A/B North? - Meeting tonight! Few other neighborhoods in the country face the uncertainty that exists here in Allston and Brighton north of the Mass Pike. That there will be massive development in the upcoming decades is a given. It is also well-established that the historically disorganized growth of Allston has resulted in many problems in areas of transportation, open space, and others. We need to return to the neighborhood-wide scope of planning that was used for the North Allston Strategic Framework. The City of Boston, residents, and property owners are creating impressive and expansive planning for other parts of the city like the Fort Point Channel / Fan Pier area. A/B North needs this too, not just the gerrymandered set of 'planning districts' proposed by Harvard. Please join us to discuss and form a new neighborhood initiative. If we want a great result, we need a great plan! Its not that any money from Congress's Farm Bill is coming to Allston or Brighton (even though there was a time when significant agriculture was happening here), but this op-ed in today's New York Times suggests some lessons that may have value to activists here. 1) "For starters, farm bill critics did a far better job demonizing subsidies, and depicting commodity farmers as welfare queens, than they did proposing alternative — and politically appealing — forms of farm support." It is not enough to just criticize someone else's proposal, no matter how bad it might be. We also need to put forward our own positive vision for what we want to see happen. 2) "And then the farm lobby did what it has always done: bought off its critics with “programs.” For that reason 'Americans who eat' can expect some nutritious crumbs from the farm bill, just enough to ensure that reform-minded legislators will hold their noses and support it"
Substitute "Harvard", "Boston College", or any other developer for "the farm lobby". Substitute "community benefits" for "programs" and "Allston/Brighton residents" for "Americans who eat. Does this sound familiar? "And then Harvard did what it has always done: bought off its critics with “benefits.” For that reason Allston and Brighton residents can expect some crumbs from the campus expansion, just enough to ensure that City Hall will support it." 3) "However many worthwhile programs get tacked onto the farm bill to buy off its critics, they won’t bring meaningful reform to the American food system until the subsidies are addressed — until the underlying rules of the food game are rewritten. This is a conversation that the Old Guard on the agriculture committees simply does not want to have, at least not with us." "However many worthwhile benefits get tacked onto the development to buy off its critics, they won’t bring meaningful reform to the planning process until the lack of a comprehensive plan is addressed — until the underlying rules of the game are rewritten. This is a conversation that the Old Guard simply does not want to have, at least not with us." The author concludes that "the politics of food have changed, and probably for good. If the eaters and all the other “people on the outside” make themselves heard, we just might end up with something that looks less like a farm bill and more like the food bill a poorly fed America so badly needs." Can enough of us make ourselves heard so we might end up with something that looks more like a balanced and thoughtful approach to development and less like a rush to build anything that is proposed? Let's give it a try! Please join us tomorrow night - Monday, Nov 5 at 6:00 at the Gardner School, 30 Athol St for the first meeting of the A/B North Neighbors Forum. "The proposed interim space for the Art Museums represents a critical first step in a planned sequence of activities making way for the much-needed renovation of HUAM’s existing facilities." "The Art Museums’ collections consist of approximately 250,000 art objects, although fewer than 1,000 objects can be accommodated at any given time in the public galleries. This shortage of adequate space for the collections, coupled with deteriorating infrastructure and the absence of climate control in many collection areas (both storage and galleries), underscores the need for a major renovation of the existing Museum facilities and the pursuit of opportunities for new space in Allston. Substantial renovation of the current HUAM facilities requires that the collections and staff be relocated and the existing buildings vacated. 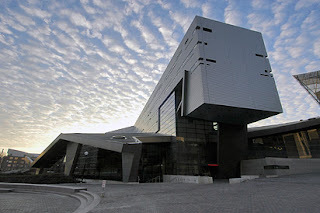 Temporary space is needed to accommodate the collections and staff during the renovation period." Sounds pretty urgent. Words like "requires" and "needed" and a general sense that this new facility is needed ASAP. "Existing facilities are overcrowded, do not meet professional standards for art museums, and cannot currently be accredited as a professional art museum. HUAM proposes to relocate a portion of its collection and operations to Allston to facilitate the HUAM master plan objectives." "The Project is planned to serve HUAM at a critical phase in the history of the institution. The historic site at 32 Quincy Street is slated for a long overdue renovation and modernization. The Project will serve as the University’s primary museum facility during the course of the 32 Quincy Street renovation." In March 2007 when Harvard decided to postpone review of the Art building, the Harvard development team treated it like they were making a major concession to the community. "We would really like to reaffirm a partnership and work with the community,” said Harvard's Allston COO Chris Gordon. After all this, it is surprising to read in today's Globe that Harvard's Allston art building change-of-heart had nothing to do with community concern and there was no need to build this building in Allston before renovating the Cambridge museums. Harvard is going ahead with the renovation of the Fogg museum on Quincy St in Cambridge with no new facility in Allston. And the reasons Harvard gives for delaying the Allston project are cost, complexity, and timing. "We just could not make the timing schedule work for both projects, and rather than have the Quincy Street project wait, we decided to give the art museums the go ahead to do the Quincy Street plan," said Kathy Spiegelman, chief planner of Harvard's Allston Development Group. Cost, HUAM director Thomas Lentz acknowledges, is an issue with the Allston project. So are proposals for a range of other cultural facilities in Harvard's expanded Allston campus. "I think a wider, overriding concern is how it is all going to work in Allston? How do the art museums relate to performing arts facilities or theater facilities or music facilities?" Lentz said. "Those are all big, thorny questions to grapple with." So when Harvard says something is urgent, is it really? Will we read in the newspaper a few months later that the reasons we were given for Harvard's planning decisions really weren't the true reasons? With this project we now know the answers - 1) No, 2) Yes. For the next project only time will tell. The BCDC will meet in the BRA Board Room on the 9th floor of City Hall on Tuesday, November 6. The meeting starts at 5:15. At 5:20, a 10 minute report from the Design Committee is scheduled to discuss the planned expansion of the Genzyme factory in Allston. For more information contact David Carlson at David.Carlson.bra@cityofboston.gov. State lawmakers in the Senate and House are submitting legislation to delay the toll increases recently approved by the Turnpike Authority. A/B reps Honan and Moran are co-sponsoring the House bill and Senator Tolman is a co-sponsor in the Senate. (d) The commission shall submit their report to the Joint Committee on Transportation no later than 90 days from the date of release of the findings of the Massachusetts Turnpike Authority Board’s working group on toll inequities. According to The Globe, one of the firefighters had a blood alcohol level of 0.27! Can that be true? Online calculators suggest that a 170 lb. man would have to drink 12 beers in 1 hour to get this drunk! As far as I can tell, nobody in the Fire Department has lost their job as a result of this total failure of leadership and management. All I can find evidence of is another review panel getting together to make policy recommendations (see Panel to review Fire Dept. policies). Someone running for City Council might demand that the Fire Chief resign or some major disciplinary action for the manager responsible for the performance of these men. Instead, almost half the candidates don't support random drug testing of firefighters and offer no alternative solutions in The Globe's story. If the new firefighters' contract does not include random drug and alcohol testing, candidates Flaherty, Arroyo, Connolly, Hogan, and Wyatt said they would not vote to fund it. Candidates Murphy, Yoon, Geary, and Estrada said they would support a firefighters' contract without such testing. Other than this yes-or-no question, all the candidates come across as pretty indistinguishable in the Globe's story. None of the candidates quoted in the article said anything nice about the Mayor, especially in the areas of crime prevention and stifling debate. Below are some excepts from today's press release about Harvard's intention to reconsider the role of art in the university. What seems to be missing is consideration of how the artistic resources of a university (the collections, the artists, the art historians, etc.) can interact with and enrich the general public. Being a good steward of these treasures means sharing them, educating people about them, and inviting as many people as possible to enjoy them. Hundreds of thousands of pieces of art locked away in storage and accessible to a select sub-set of our society should not be part of Harvard's vision. ...We confront ever-increasing demand for opportunities for artistic expression both within and beyond the curriculum. We anticipate a significant place for the arts as a central component of our growth in Allston." Join City Council Candidate Mark Ciommo tonight, Thursday, November 1st, for a campaign rally at the Bus Stop Pub (252 Western Ave, Allston between Everett & Riverdale) from 6:30pm - 8:30pm.